Digital agency Freestyle Interactive clinched four top marketing communication awards, including the coveted Grand Prix, at last week’s annual Marketing Industry Networks award night. In a stunning evening, Freestyle overcame competition from regional and nationwide agencies to take the number one spot in the following categories: Digital Agency of the Year; Best Marketing Business in the Midlands, Best Mobile Campaign for Arriva Bus and the ultimate award The Grand Prix. Freestyle, one of the largest independent digital marketing communication agencies in the UK is a Midlands business success story. With a strong existing client list, Freestyle opened the doors to its first European office in Paris back in September 2011. With a heritage in building and designing corporate & brand websites, Freestyle is also growing rapidly in the mobile, social media, search and online PR fields. Judges comprised experts from both the agency world and in-house marketers. 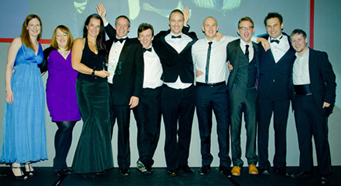 Richard Draycott, Managing Director Marketing Industry Network: “I was delighted that Freestyle Interactive collected the Grand Prix awards at MiAwards 2011. The judges were very impressed by how Freestyle has managed to increase its revenue, grow its staff numbers and protect its margins during what we are continually told are very tough economic times. MiNetwork is the networking, live events, training and business development support arm of The Drum magazine and website, created to help you grow your agency business and develop your career.Now in its third year, the MiAwards identify and highlight the very best in marketing, media and communications agencies, teams and individuals across the whole of the UK. Freestyle Interactive is 15 years old and is one of the UK’s largest independently-owned digital agencies - the biggest in the Midlands. Employing 68 we are a full service interactive agency providing digital communications consultancy and delivery across all digital channels. Volvo, Lloyds TSB, Thales, Alstom, Amtico, Baxi, Mapa Spontex, NUK, TNT and Arriva Bus are included in the Freestyle client portfolio.